So humor me, if you will, as I share nine things you can learn about small business marketing from watching baseball. 1. The leadoff hitter sets the table. Like the first batter in a baseball lineup, the subject line of an email campaign, the text of your tweet, or the lede paragraph of your blog post sets expectations for what’s to come. Start with a “hit,” and the reader will continue to the rest of your message or blog post, or will click through to read what you are sharing. 2. It’s a long season. It’s rare for teams and players that are hot in April to still be on top in October (which is why I’m not sweating another slow start by the Red Sox this year). Most just need a little time to warm up, and that’s when the season really begins. It’s like when you’re just starting out with email, social media, or another marketing tactic. Often, you have to allow yourself time to learn, practice, and get warmed up. 3. Small players can make a big difference. Red Sox fans worship at the altar of Dustin Pedroia, a player who’s one of the smallest in the game. His size initially led others to underestimate his abilities. Big mistake: Dustin won the American League’s Rookie of the Year award in 2007, followed it up by being named MVP in 2008, and he’s won Gold Glove awards multiple times. He continues to be one of the most feared hitters and most aggressive players around. Similarly, just because you’re a “small” organization that doesn’t mean you can’t be a big player. Tools like social media can help you level the playing field. 4. You’ve gotta please your fans. Team owners everywhere know that if there aren’t people in the stands, there’s not as much money coming in. So they do their best to give the fans what they want: good players, good food, and entertainment. Are you giving your customers the kind of content they want in your email marketing and on social media — and in general, the kind of great customer experience that can separate you from the pack? And by extension, are you encouraging your happy fans and advocates to tell their friends about you? 5. It’s not all about the long ball. In your own marketing efforts, don’t try for a big, long email message, a bunch of social media posts all at one time, or one huge sale that will make your season. Concentrate instead on a consistent series of shorter communications, and a consistently good customer experience. 6. Sometimes you have to plan a special event to bring people in. Sometimes fans need a little extra incentive to come out to a game (or to patronize your business), so teams host tribute nights, bobble head doll giveaways, and other special events. The Open House yesterday at Fenway is another perfect example of this. What special events do you plan for your customers? 7. It’s about the team, not individual players. Albert Pujols and David Ortiz are great, but they’re just individuals. In fact, you can have an entire team of All Stars, but if they don’t work together as a team, then it could all be for naught. Similarly, don’t focus on one marketing channel or another. Focus on using them together. For example, email and social media work well on their own, but when used together, they’re an even more powerful force. 8. Winning teams have good coaches. In baseball, the manager provides strategy and helps his players to take their performance to the next level. Similarly, we can all benefit from good coaching. If you’re looking to be a better marketer, there are lots of sites you can read, like MarketingProfs, American Express’ OPEN Forum, and CopyBlogger, and lots of people on Twitter you can follow to get great information, content, and insights about engaging customers, not just selling to them. Some examples of good folks to follow are Scott Stratten, Ann Handley, C.C. Chapman, and, not to be too egotistical, but … me. 9. Sometimes you have to steal. How often do you look to see what other businesses and organizations in your industry or local area (both big and small) are doing? Learn from those examples, and adapt their ideas to suit your own purposes. Need some ideas? My old friends at Constant Contact share customer success stories on their blog all the time. Sometimes it takes a step back to learn the most important, and basic, of lessons. 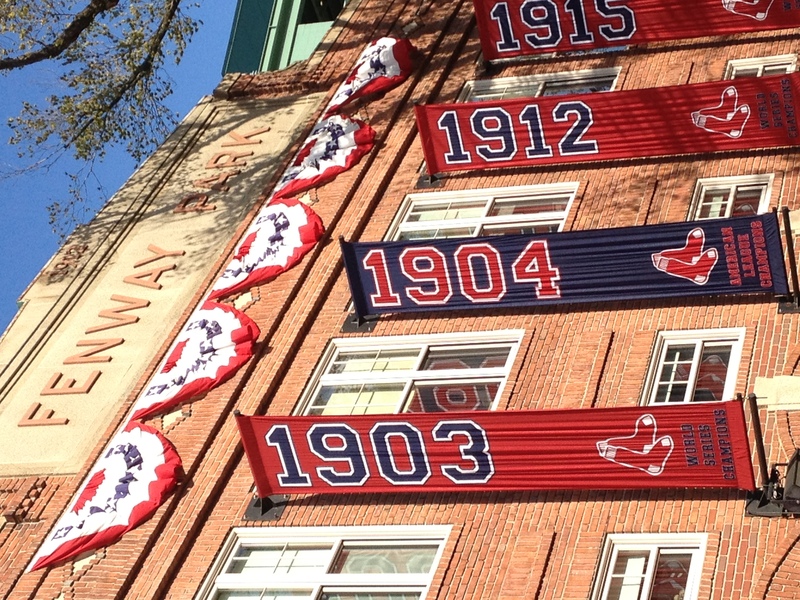 It took the occasion of Fenway’s 100th birthday for many fans to overlook current troubles and remember what worked during those the glory days when things were good for the team. Hopefully the positive energy from the event will have long-lasting effects on the Sox this year and beyond. Similarly, let this be a time when you reassess your efforts. Will this be the year your marketing program hits a home run? Can you think of other ways baseball and marketing are similar? Share your “extra innings” comparisons in the comments field below. ← Can this Film Stop the Bullying Problem?